Quartzite has risen in popularity in the past few years for its incredible durability and ability to mimic the look of marble without the hassle. While granite can be sourced in many stone colors, quartzite is limited to grays, whites, and beiges, but that will not upset the constant demand for light neutral, natural stone countertops. Today’s busy households are not necessarily the best environment for white marble kitchen countertops because marble is very porous and will etch easily and chip over time. Marble requires sealing up to 4 times a year, as compared to quartzite or granite, which only require sealing 1-2 times a year. 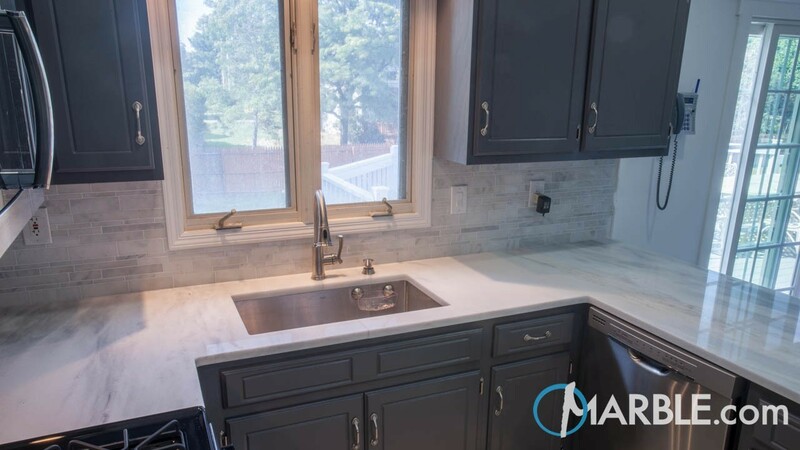 Countertop fabricators can establish a relationship with SlabMarket to ensure that their inventory is adequately stocked with all popular types of quartzite. You can have SlabMarket ship you a container filled will any type of slab and you can restock your inventory as needed down the line. They have perhaps the widest inventory of stones in the area with deep supplies of the popular quartzite and marble stones from quarries from all over the world as well as a wide selection of more exotic stones. Quartzite is not as durable as granite, but it is pretty close in strength. As mentioned above, it outperforms marble for its heat resistant, stain-resistant, and chip resistant qualities. As homeowners realize that there are sturdier and beautiful stones like quartzite on the market, they are opting for quartzite because they are more durable and will perform better with minimal maintenance for years to come while still delivering the same light and attractive surface. Since quartzite is a strong stone, it is an ideal surface for bathroom vanities and kitchen countertops. While being chip resistant and heat resistant, it is a visually striking stone. Quartzite is a hard, metamorphic rock that forms from pure quartz sandstone. The sandstone turns into quartzite when heat and pressure related to tectonics compression occur. Quartzite has an earthy look that suits nearly every home whether it is installed as kitchen countertops, bathroom vanities, or bathtub surrounds. The neutrality of the color will allow you to change the rest of the colors and design in a bathroom or kitchen easily to change up the feel of a room. There are many types of popular quartzite stones available, especially the wonderful Super White quartzite, the pristine Classic White quartzite, the lovely Cirrus White quartzite and the elegant Snow Crystal quartzite to name a few. The four stones mentioned here are quite similar to those found in white marble, so more and more homeowners are installing these stones in their kitchens and bathrooms. White marble is a sought after stone but very high-maintenance. The next best thing would be to choose a quartzite that has similar patterns as white marble. The four mentioned above have almost the same look as marble but less of a hassle when it comes to maintenance. Some people cannot even tell the difference between these two types of stone! Once a customer knows that they want to install quartzite in their home, they should explore all the available types of this stone. A slab yard needs to have a wide inventory of stones, encompassing all varieties of quartzite instead of one sample. Super white quartzite has a large amount of gray veining throughout the stone, whereas classic white and cirrus white quartzite contain a larger percentage of white within the stone. Snow Crystal quartzite, has a lot more of a marbled, crystal-like look to the stone that can create a wonderful focal point in a kitchen. No two slabs are alike, however, so a homeowner cannot just select a stone based on images found online. There will be great variations within each individual slab. Quartzite is a beautiful natural stone that, with proper maintenance, will perform well for many years. It is versatile stone that will accommodate new homeowner’s design preferences while providing a clean and crisp surface from which to design around. Today’s kitchens and baths are so busy and receive so much traffic that quartzite is here to stay.